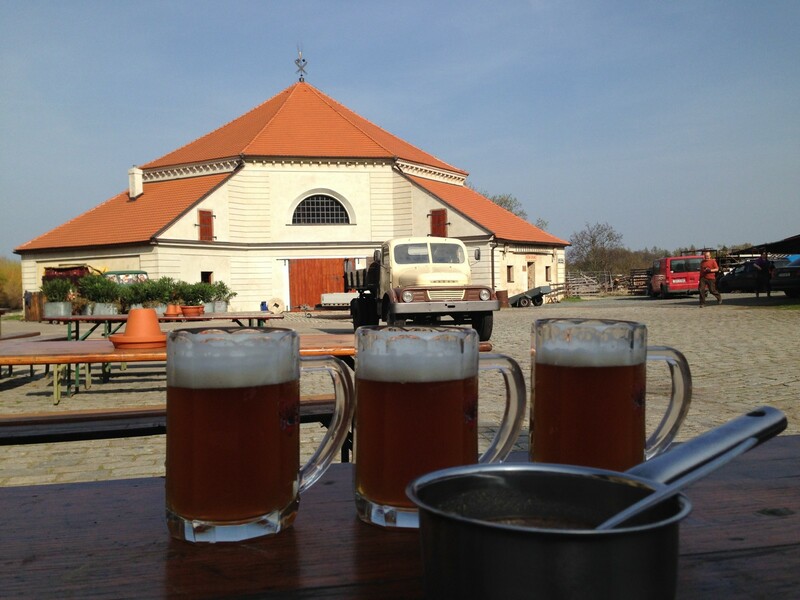 The tradition of brewing, malting, and annual fairs in Kostelec nad Černými lesy dates back to the 15th century. At that time, King Vladislav, by Godś blessing the King of Bohemia, promoted this community to the rank of city. The original chateau brewery burned down in 1836, and within three years a new brewery was built from scratch on the city's outskirts. In 1898 the brewery was rebuilt to be powered by a steam engine. The Board of Innkeepers' Brewery Joint-Stock Company acquired the brewery in 1924, and the communist government seized it in 1948. After 1986, only the fermentation hall, malting plant and lager cellars were operating in the brewery. The hopwort was transported here from the brewery in Velké Popovice, and the finished product was transported back again. In 1994 the operation was definitively ended. The "May God give luck" traditional brewing greeting took on a new meaning in 2001. The same name was given to a new limited liability company, which had decided to put the city back on the map of Czech breweries. An extensive brewing museum with original brewery equipment was built here. The most interesting exhibits include the two-vat copper brewhouse with shafting, cooling units, functional steam engine, functional cooling ammonia compressors, and hundreds of other machines and exhibits. The entire exhibition covers some 4000 sq m. The museum also includes collections of ceramics and creative arts depicting brewing and hospitality themes. A comprehensive exhibition mapping the brewing and malting industry in the Czech Republic offering an extensive database, is yet another, equally important part of the museum. At the end of the tour through the museum, visitors can relax in a brewery restaurant designed in the prewar style. Real production of beer should be launched here before the end of 2008. On the brewery premises, an octagonal gin structure - a horse-powered mill - can be found. The mill with its accessories is a unique architectural and technical landmark. Especially remarkable is its roof frame. List of attractions and services: Museum, brewery restaurant with its exclusive pre-war interior, company parties, catering services available in unique interiors that include the gin, malting floors, malting cellars, lager cellars, an industrial hall, stylish lodging in the chateau, brewery spa, and tennis courts. Catering everywhere you want like in motto: "from wedding to sleeping". Expert beer tasting, field trips for any number of participants (from 1 to 1 000). Night tours with tasting, field trips in different languages, catering anywhere, anytime for anybody. Parties and tours / sight-seeings with enjoyable brewer's programs. You can also brew your own batch of beer (cca 100 litres) using manpowered equipment from the turn of the 19th and 20th centuries.